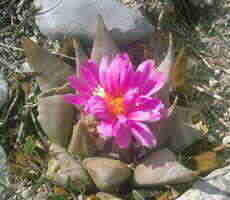 Ariocarpus retusus 'confusus' LRM78, the deep pink form of the plant flowering in November. 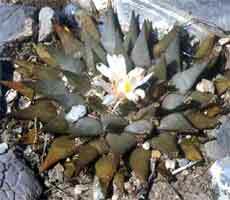 Ariocarpus retusus 'confusus' LRM78, white flowering specimen. 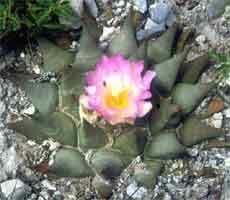 Ariocarpus retusus 'confusus' LRM78, a bicolored flower, all 3 photos are from the same population. The population of A. retusus in the Aramberri area is extremely variable, plants exhibiting massive variation in stem morphology and flower color, the population at which these photographs were taken was predominantly pink flowered, but all other variations were also present. Stem morphology ranged from typical A. retusus to typical A. trigonus. See the Aramberri Enigma for further discussion of this extremely interesting and puzzling plant.